Easier to root than woody, nonsucculent plants, succulents have a built-in water supply in stems or leaves that allow the cutting to resist drying out when detached from the mother plant. Succulents also root readily from the bases of leaf nodes, which are the areas where the leaves attach to the stem. Succulent members of the Crassula family often spontaneously form aerial roots that dangle from the stem toward the soil, such as tree aeonium (Aeonium arboreum), which grows in U.S. Department of Agriculture plant hardiness zones 9 through 11. For some trailing succulents, the stems root wherever they touch the ground. 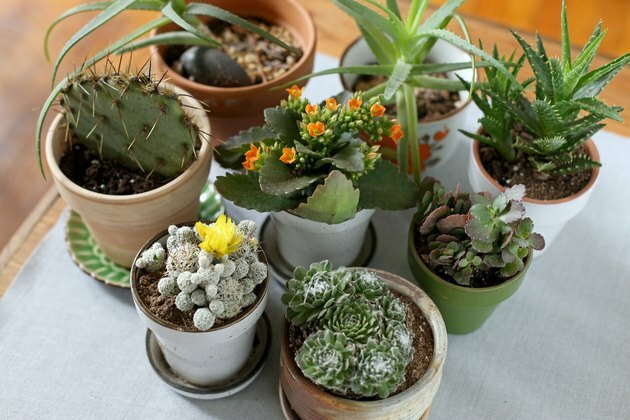 For the fastest rooting, take cuttings from leafy succulents when the plants are growing, usually in spring. 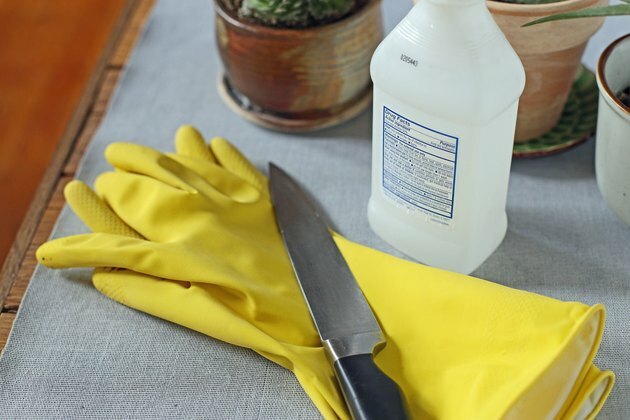 Wipe the pruners, a sharp knife or scissors with a cloth soaked in rubbing alcohol to prevent disease spread. Cut off about 3 to 5 inches from the end of a stem. Break off the lower leaves so there's a bare area on the bottom of the stem about 1 to 2 inches long. Place the cutting in the shade for two days to a week, depending on the size of the cut stem, until it forms a hard layer over the wounds. Fill a 3-inch-wide pot with equal parts of peat moss and perlite. Use a pot that has drainage holes. Insert the bare stem end into the potting mix. Water it until water drains through the drainage holes. Put the pot in a shaded area until new roots form. Euphorbias (Euphorbia spp.) 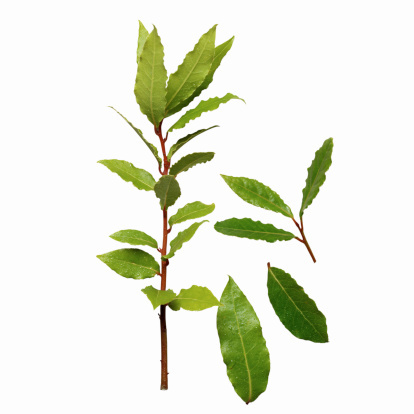 have milky, toxic sap, which can irritate skin, eyes and mucous membranes. Wear protective clothing with closed shoes, waterproof gloves, long pants and long sleeves before making euphorbia cuttings. 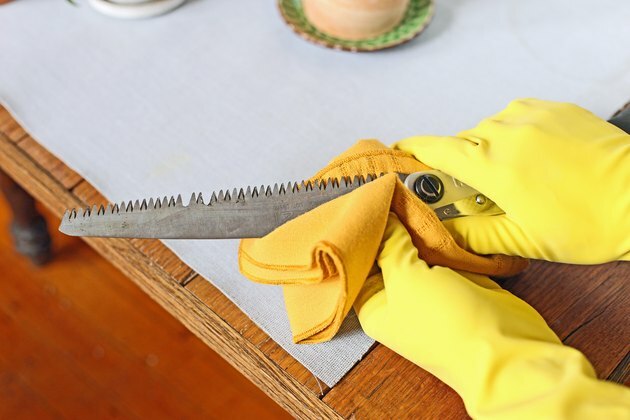 Using disinfected pruning shears or a sharp knife, remove about 6- to 12-inch-long cuttings from branch ends in spring or summer. To wash away the milky sap, dip the cut end into a container of clean water. Then dip the cut surface into rooting hormone, and place the cuttings in a shaded place to heal, which usually takes several days. 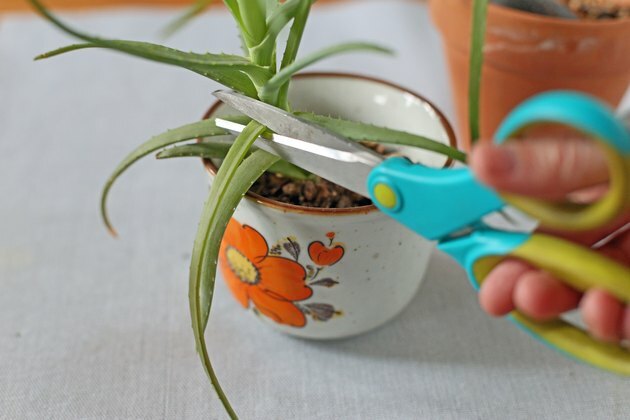 Use pots 1 to 2 inches larger than the cutting's stem and just deep enough to keep the cutting from tipping over. Water the cutting and allow the soil to partially dry before watering again. Examples of commonly grown euphorbias are mottled spurge, also known as candlestick plant (Euphorbia lactea), which grows in USDA zones 10 through 11 and crown of thorns (Euphorbia millii) which grows in USDA zones 9b through 11. 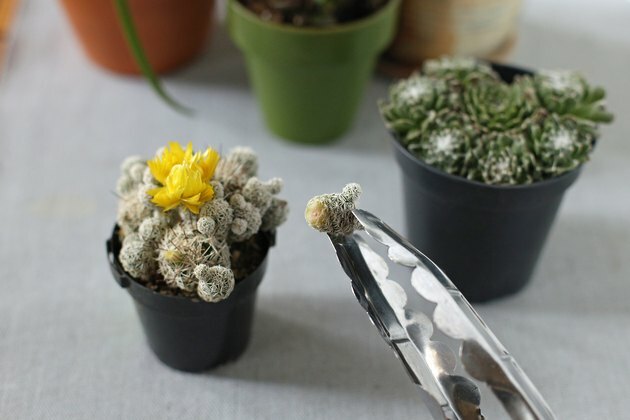 For cactuses that have rounded or cylindrical branches that cluster from near the base of the stem, cut off individual branches in spring when they're about 2 inches wide. Make the cut as flush with the main stem as possible. Sometimes the connection is thin enough that you can break the branch off by grasping it with a pair of kitchen tongs and gently twisting. An example is Easter lily cactus (Echinopsis oxygona), which grows in USDA zones 8 through 11. Set the cutting in the shade and wait for the cut to heal. Then, insert the bottom end into the potting mix just so the cutting doesn't become dislodged. Choose a pot size 1 inch larger than the cutting's diameter. For thick-stemmed columnar cactuses, such as Peruvian apple cactus (Cereus repandus), which grows in USDA zones 9 through 11, use a pruning saw cleaned with a cloth soaked in rubbing alcohol. Take cuttings in spring. Remove from 1 to 5 feet, handling the stem with a piece of rope looped around the stem. For longer cuttings, have someone else hold the rope while you make the cut. You may need two pieces of rope, one at each end of the cutting. Lay the cutting in the shade for up to several weeks to allow the cut surface to heal. Then, bury the cut end directly into the garden or in a pot large enough to accommodate the stem without the cutting falling over. Stake it, if needed. Put the cutting in a shaded area until roots form. Water it occasionally as it roots and water more frequently after the roots grow.